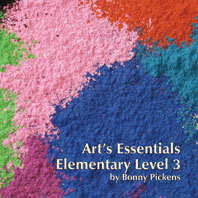 Art’s Essentials is based on the Elements and Principles of Design. It is a multi-media broad based curriculum with the goal of being on the exact specific skill level of each grade. This program will lay down the essential skills needed by teaching basic techniques in a variety of media. It will challenge them while they are learning but not be so overwhelming that they are frustrated. It is meant to inspire success. The lessons are time tested, scope and sequenced oriented-with one lesson building on the next. They start out with one class lessons, getting longer and more difficult with each grade level. The arts program is also cross curriculum, showing how what we are doing in art relates to what they are learning in the classroom. Not that we are there to back up classroom teachers, but that our program and what we are teaching can and does effect other areas of learning. The curriculum is meant to be flexible as all elementary art classes have to adjust their schedules to take in special testing, field trips, programs, fire drills, tornado drills, and whatever else gets thrown our way. Above all, as should be the goal of any curriculum, it is meant to develop well rounded, well educated, cultural citizens who can make a positive contribution to society. Level One picks up where Kindergarten ends. It takes the procedures and techniques taught the year before and builds on them. Consistency is the key. This curriculum takes the basic directions and makes the lessons a little more complicated, a little more challenging while meeting the psychomotor and cognitive abilities of the students. The lessons teach what art is, how it is cultural and symbolic, and how it is utilitarian and aesthetic. Basic drawing, painting, ceramic, printmaking, computer graphics, constructions, and sculpture techniques are explored. Students learn about art history and what makes an artist famous. 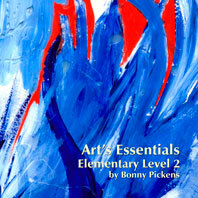 The Elements and Principles of Design will be the base for all lessons and shown to be the groundwork of all artworks. They will practice how to use the art supplies, how to clean up, and how to store them properly. They will learn how to be conservative with them so they will last. The pace will be set as what on task behavior is required and when, how long to work on the projects, and when and where to turn them in. They will learn about art shows and practice taking cautions around other’s art works. This year builds on the basics and takes them one step further. 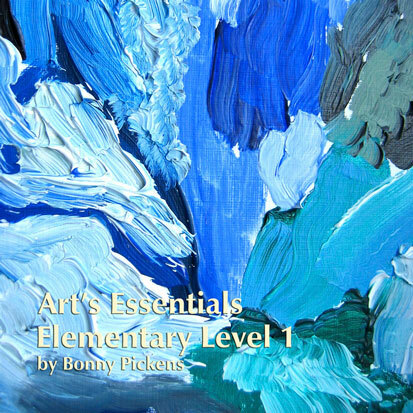 Art’s Essentials is based on the Elements and Principles of Design. It is a multi-media broad based curriculum with the goal of being on the exact specific skill level of each grade. This program will lay down the essential skills needed by teaching basic techniques in a variety of media. It will challenge them while they are learning but not be so overwhelming that they are frustrated. It is meant to inspire success. The lessons are time tested, scope and sequenced oriented-with one lesson building on the next. They start out with one class lessons, getting longer and more difficult with each grade level. The arts program is also cross curriculum, showing how what we are doing in art relates to what they are learning in the classroom. Not that we are there to back up classroom teachers, but that our program and what we are teaching can and does effect other areas of learning. 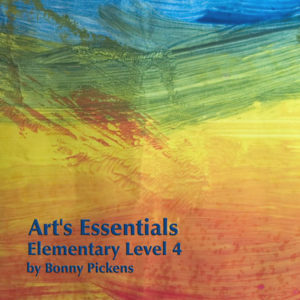 The curriculum is meant to be flexible as all elementary art classes have to adjust their schedules to take in special testing, field trips, programs, fire drills, tornado drills, and whatever else gets thrown our way. Above all, as should be the goal of any curriculum, it is meant to develop well rounded, well educated, cultural citizens. 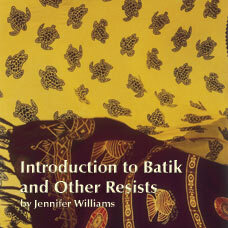 535/ISBN: 978-1-59657-993-4, 535/ISBN: 978-1-59657-339-0, Class Set download files: 978-1-59657-994-1, 152 /ISBN: 978-1-59657-445-8, 152/ISBN: 978-1-59657-340-6, No page count.No ISBN number. Use product code.